On a cold winter night, you get home to find that no one is there since your parents had said they would be visiting your grandparents for the weekend. Everything seems to be perfectly normal, until you are suddenly roused from your sleep by unexplained noises at 2:45 am! Soon, you discover that your home has transformed in bizarre ways. You quickly find yourself in the midst of a terrible nightmare, but as far as you can tell you are not asleep. 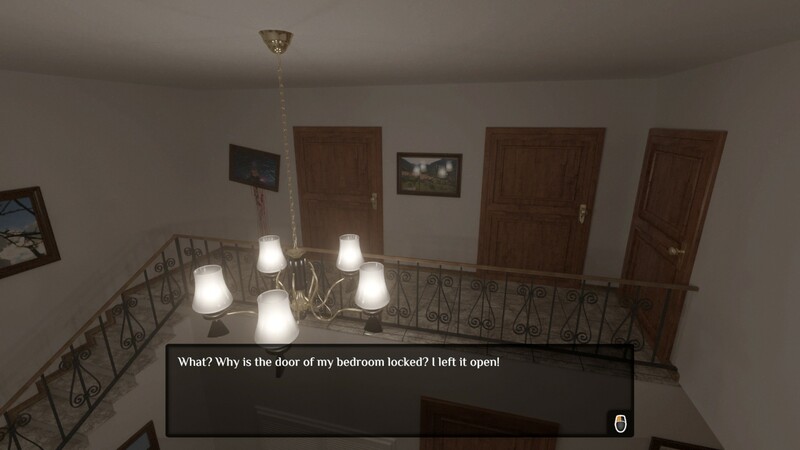 Can you get to the bottom of this mystery of horrors in Without Escape? Investigating your parents’ room for the source of the noises. Finding a key and checking your inventory. You can check your inventory with the I key. This just lets you see what you have, but you’ll never need to drag items from it. Instead, you use an item by just clicking on whatever object it goes to in the world. There’s not much to find in your parents’ room at first, but as you leave the bedroom, you’ll soon find another strange thing, this time with a touch of blood. 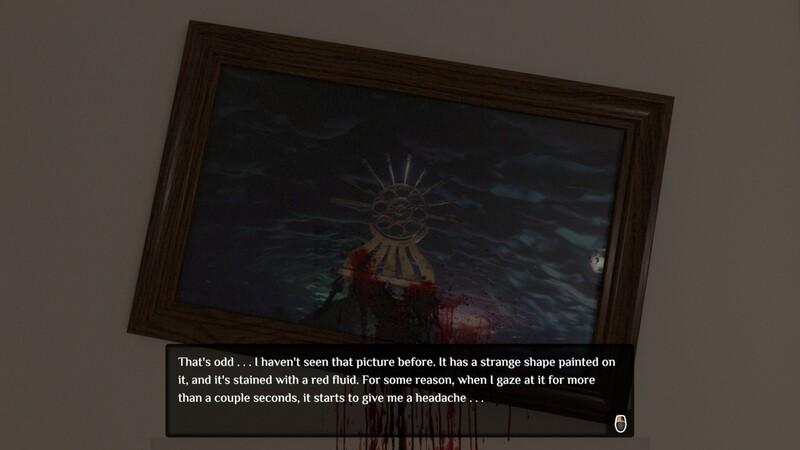 Discovering an odd painting with blood below it that allows you to save your game. 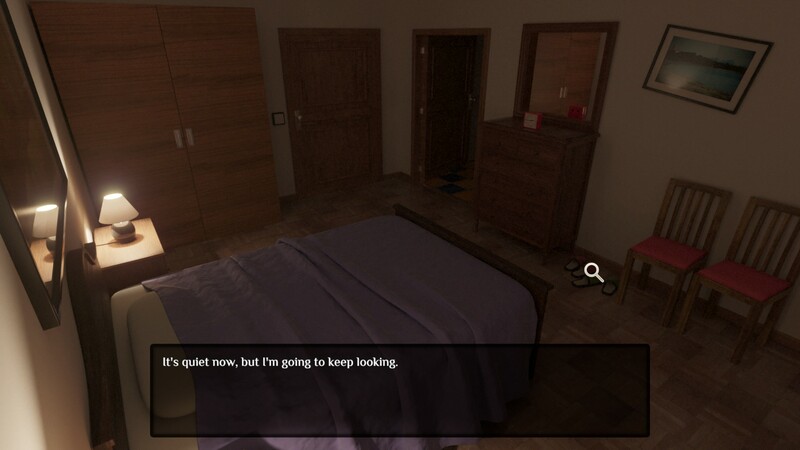 You’ll find your first key very soon, allowing you to get back into your own bedroom, which somehow got locked after you left it. This is only the beginning of the strangeness that you will encounter on this night, though. 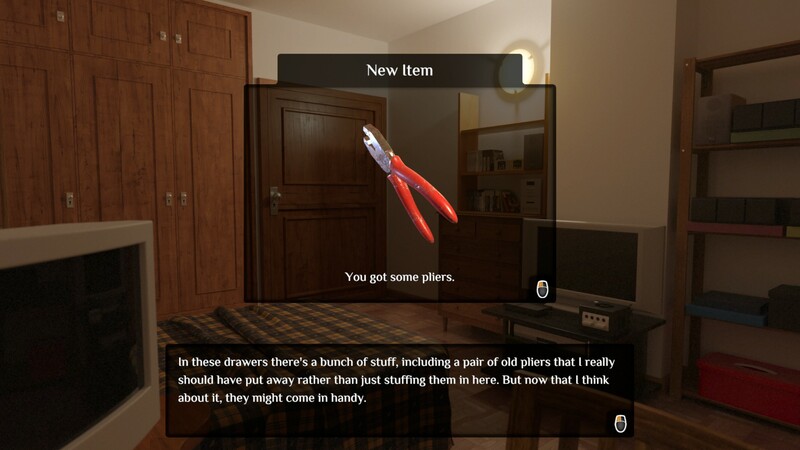 Inside your room, you’ll find some interesting things like a pair of pliers and a nod to some classics of gaming. Looking around your bedroom and still wondering how it got locked. You may notice some familiar looking objects in front of the TV. On the left is your RadStation 2, and on the right is your Mintiendo Breakcuve. Clicking on the RadStation 2 only gives you a simple text description with its name, while clicking on the other console gives you a closeup of it. Neither of these plays any role in your adventure, as they are just nostalgic nods to some classics of gaming’s past. I quite enjoyed this unexpected nod to gaming history. Sadly, you don’t have time to play any games on it, though! 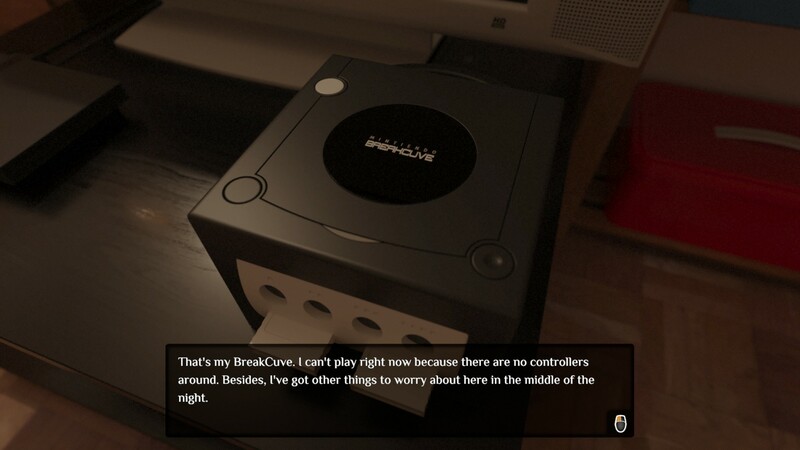 A close-up of your Mintiendo Breakcuve, a nod to a classic Nintendo console. With no time to waste and not knowing where your controllers are, you have to leave the console behind and continue your investigation. Unfortunately, things just get weirder, as you soon find yourself in a transformed version of your home. 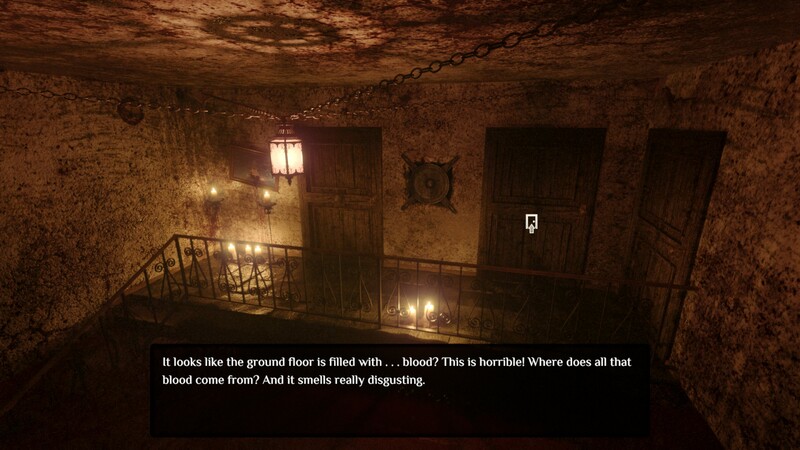 It’s much dirtier, with a dank, dungeon-like atmosphere. The layout is unchanged, at least in this area. It seems rather hot in here now, and your home has transformed into a dungeon of sorts? 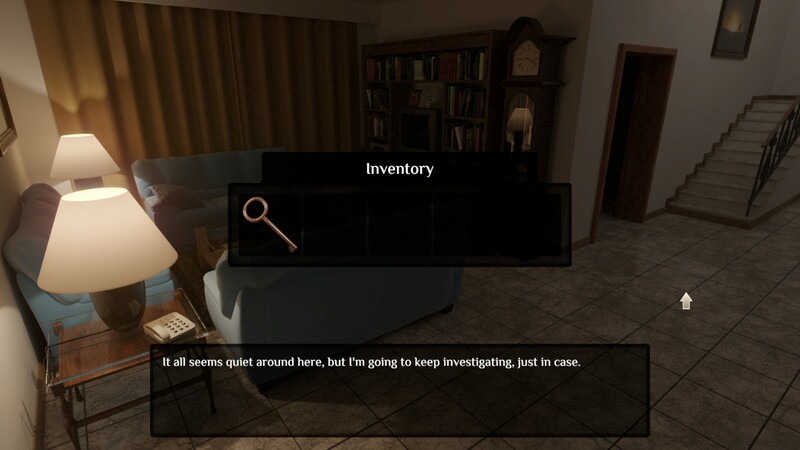 The gameplay in Without Escape basically boils down to going around from room to room looking for items that will help you do something in another location. It may be a key that helps you open a locked door, or an item that helps you get something out of a dirty toilet. You will encounter puzzles ranging from simple to a bit obscure. For example, once you’ve found a key, you need to figure out what it unlocks. That’s the simplest type of puzzle, while some are more obscure, like the one where the hint is an ear. You find a speaker on the wall that chimes five times, but you’re not sure what to do with this information after that. You have to put it into a clock, but its relative to a certain time you have to find elsewhere. Most of the puzzles aren’t too hard to figure out, though. There is one annoying math puzzle later in the game, too. You may notice that the main menu background has changed colors after I beat the game the first time. Another puzzle had a very strange design choice. It says you need a specific water temperature, and the hint is that it is the atomic number of some element. The element in question is random in each playthrough, but there is no Periodic Table of Elements in the game world, requiring players to pop out of the game and Google it. This tends to break immersion, so it’s a rather puzzling design decision. 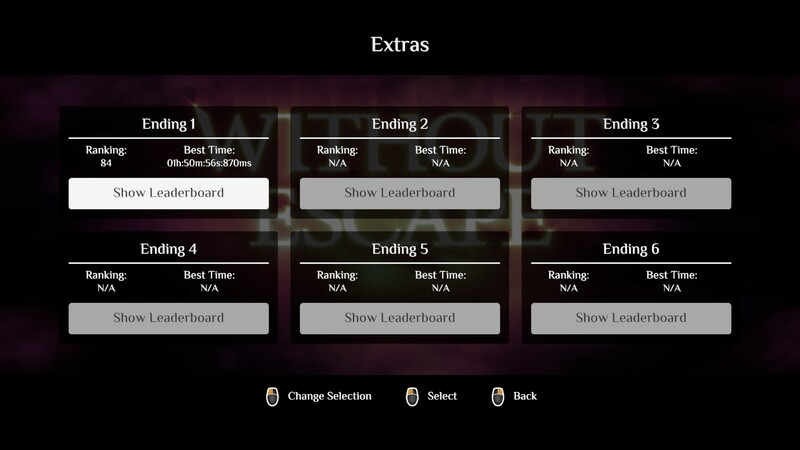 Most of the game is the same on every playthrough, but there are six different endings to get and leaderboards for each. 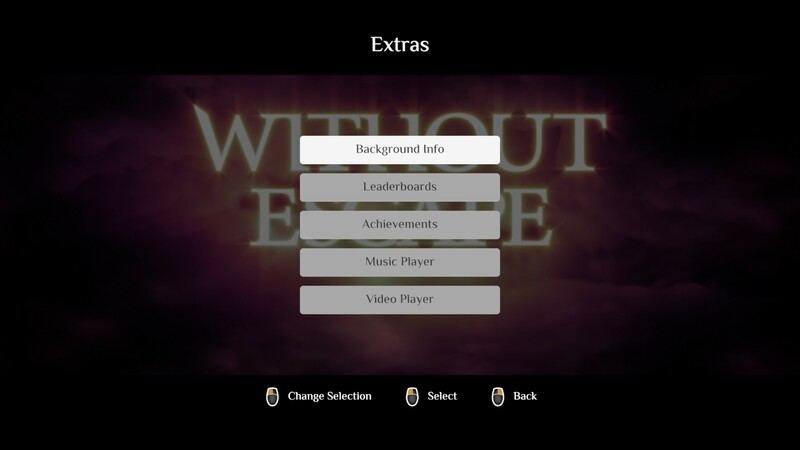 Beating the game unlocks some things in the Extras menu, like a short history of how Without Escape came to be, and its past iterations. Beating the game unlocks some goodies in the Extras menu. The visuals are very nicely done, as you can see. You’ll see blood and even lava, and they look highly detailed like everything else. There isn’t much music in here, but what’s there gets the job done pretty well, creating an uneasy atmosphere. The game is never all that scary, though. Without Escape is a pretty short game overall. It makes up for this with a little bit of replayability in the form of five additional endings to get. The game has a handful of achievements on Steam, too. The replayability does suffer since every playthrough is nearly identical, with the exception of some extra areas you can find to get some of the endings. If you know what you’re doing, you can blow through a playthrough in under an hour. I’ve spent two to three hours in the game with one complete playthrough and part of another. The game is available on both Steam and the Windows 10 App Store for $6.99. You can also get the soundtrack for an extra $1.99. It’s entertaining for a while, but it’s not a game you will play very many times. Can you find and solve your way through every obstacle and uncover the bizarre truth of what’s going on in your home tonight?